They proved to be a big hit - my girls love hanging over the side of their beds to choose a book - and even now - months later, they still put them away in them!! That has got to be a bonus! At the time, several people asked if I had a tutorial for these pockets. Well finally, I got around to making up a tutorial, as I decided to make more pockets for the spare bedroom bed to accomodate the girls growing book collection!! down from the finished edge. Next fold the main piece of fabric right sides together to form the pocket﻿. From the fold to the finished edge should be 28cm (11”). Next you need to box out the corners of the pocket so you can fit lots of books in! in from the point. It's worth doing a double row of stitching here for extra strength. Pin in place and stitch around the edge. I found that I needed to firmly hold the fabric behind the needle as I sewed so the foot would move along the rubber grip. Finally you need to attach the top flap. Place this above the pocket, slightly below the line of stitching from the grip material on the other side. Then pin and stitch on. Now you are ready to put your pocket in place . Lift up the mattress and place the top piece of fabric with the grip material stitched on where you want it to hang on top of the bed base. Put the mattress back down, and fill with books! 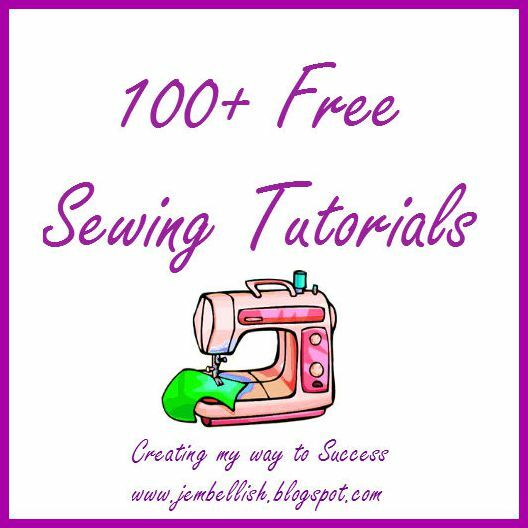 My Free Sewing Tutorials Page. That is a completely brilliant idea. I am so, so doing it for my oldest!! so love that idea! how can they not put it away when it's right there? uh oh, a feet on dashboard gal? i guess i can over look it (wink!) and halloween...i have been buying like it's going out of style. i really don't want to buy stuff, but i can't not! Even if you don't need the extra storage, I love the look these different pattern-bags make the room look - so homey. Great share because it's got me thinking. Oh wow I love these! So useful and a great alternative to a dust ruffle. That is such a great idea! I am bookmarking this one for later. I am visiting from Whatever Goes Wednesday, check me out! OOOOOH!! I love it! Going to have to make these! What a fabulous idea! Fantastic idea! I should make some to hang on my daughter's railings on the top bunk, she loves reading in bed, but I hate having to clean up the mess. Saw your link up on Hope Studios. 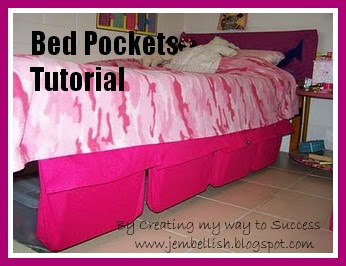 I love this, I've seen bed pockets before but never with boxed corners, what a great idea! 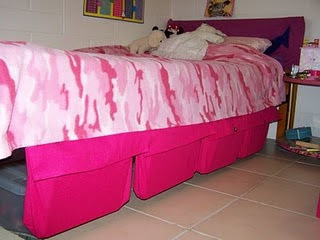 I really need to make some of these for my bed - lol. I love them couldnt wait to make them, check them out at my blog I linked back to you. On how to make them. Hope that is ok. I really enjoyed the tutorials for "bed pockets" and "insulated bag" except the dementions given were in metric only. Since this goes world wide, may I suggest you add feet and inches or a site that shows conversion chart? Looking forward to seeing more good ideas from you. Thanks! Thanks for the idea about the measurements Faye! I'm going to work through my tutorials this month (July) and add the alternate measurements too! Always looking to improve my work! I knew you were not of the US when I saw your measurements in CM! Now I have to look for CM on my fabric ruler! Wow what a great idea! I always just throw junk beside my bed, now i'll have no excuse! I'm going to make some now! Thanks for stopping by! Hope the bedpockets help keep the grandchildren's rooms tidy! It certainly helped my girls at least put their books away!! why cant you use inches instead of centimeters? some of us older ladies dont know the conversions and are just plain "old school" thanks! As I mentioned at the end of the post - if you click on the PDF link the measurements are in BOTH cm and inches. To make it EVEN easier for all - I shall add them to this post later today too. I'm making this with my friends and we are puzzled on, sadly, step one. :( How much do you double turn? I usually double turn around 1cm (approx 0.5") for each turn! Hope that helps! Happy sewing. You are a genius, what a brilliant idea, I shall be making for my daughter & myself. I have added your blog to my favorites. cannot wait to start. I made a bunch of these out of old jeans and lined them with fun fabrics. I omitted the cover. I sold them at a craft fair, and folks ate them up! One hint: When you sew on the magic grip, put a half-inch strip of waxed paper along the stitching line and the presser foot will glide along nicely. Love this idea, received through Sewing It Up from AllFreeSewing [mail@allfreesewing.com] newsletter I receive. My great-granddaughter and I both love reading in bed and the nightstands are so small no room to set down afterwards, so on the floor they go til morning. I received a Kindle for Christmas and this is a great solution since I refuse to put it on the floor! Just a note when sewing the grip material (or any other nonglide fabric) I use wax paper between the needle and the fabric. It glides easier and you can see through it. This also tears away easily. Tried to post comment on site but could not figure out the dashboard thing! Will be great for daughter since her cell phone and night meds are always under pillow or bed. This is fabulous! 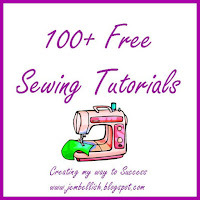 I found this through an email newsletter I get from AllFreeSewing. I'm making these this weekend! And you've given me an idea for a similar thing to put on the arm of my chair for crochet projects. If I ever figure that one out, I'll link you to a picture. Thanks! So glad you liked this tutorial Lori! I would love to see a picture if you make one! Thanks so much for this tutorial. I am from Canada and teach kids sewing classes from my home. I would love to include this project in one of my summer camps. May I have your permission to do this? I have tweeked it just slightly to accomodate younger students. I will not be handing out or selling your pattern or instructions. 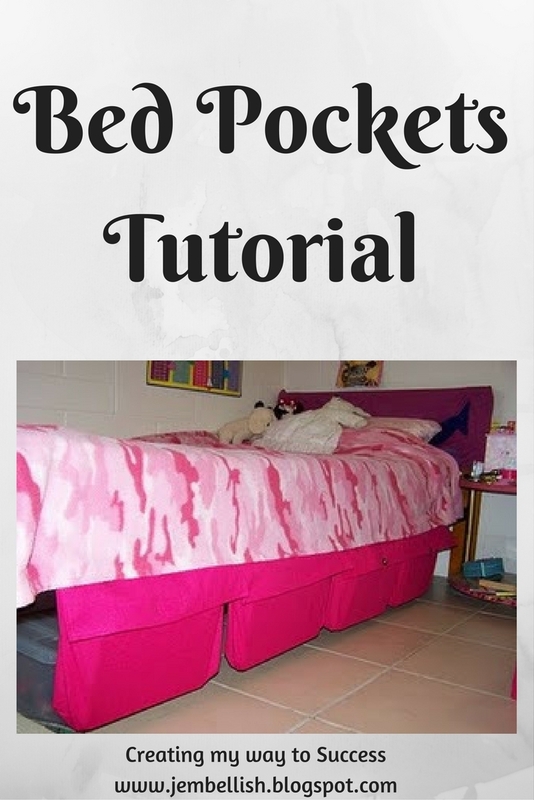 Yes, please do go ahead and use the bed pockets or any others you like from my blog. I love the fact that I'm helping people and encouraging others to sew, and all my patterns are free for all! Best of luck with it all, and I'd love to hear how the kids go with it if you do get the chance to let me know or send any pictures! !